"COVFEFE" redirects here. For the word, see Donald Trump on social media § Covfefe. 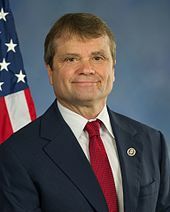 Democratic representative Mike Quigley introduced the legislation. 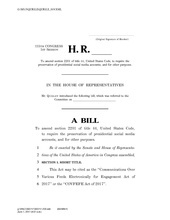 The Communications Over Various Feeds Electronically for Engagement Act (COVFEFE Act) is a bill introduced into the United States House of Representatives in 2017 (on June 12th), during the 115th United States Congress. The bill would amend the Presidential Records Act to preserve Twitter posts and other social media interactions of the President of the United States, and to require the National Archives to store such items. U.S. Representative Mike Quigley, Democrat of Illinois, introduced the legislation in the wake of Donald Trump's routine use of Twitter, stating "In order to maintain public trust in government, elected officials must answer for what they do and say; this includes 140-character tweets. If the president is going to take to social media to make sudden public policy proclamations, we must ensure that these statements are documented and preserved for future reference." If enacted, the bill "would bar the prolifically tweeting president from deleting his posts, as he has sometimes done." If the bill were enacted, it would see US law treat US presidents' personal social media accounts (such as Trump's "@realDonaldTrump" Twitter account) the same as "official" social media accounts (such as the "@POTUS" Twitter account). The bill title is a backronym of "covfefe", a misspelled word in a May 31, 2017 tweet sent by Trump, reading "Despite the constant negative press covfefe". This incomplete tweet was liked and retweeted hundreds of thousands of times, making it one of the most popular tweets of 2017, as people speculated on its meaning. By 5:48 AM ET, the tweet was deleted, and at 6:09 AM ET, Trump's account tweeted, "Who can figure out the true meaning of 'covfefe' ??? Enjoy!" During the May 31 White House press briefing, Hunter Walker of Yahoo! News asked White House press secretary Sean Spicer about the tweet and if there was any concern about the president sending out incoherent tweets that stay up for hours. Spicer responded, "I think the president and a small group of people know exactly what he meant" and offered no other explanation. This unexpected response spawned additional media attention and criticism for its cryptic meaning, with commentators unsure if Spicer was joking or not. Callum Borchers of The Washington Post's The Fix noted that the Trump administration might have deliberately responded in a way that encouraged the media and the public to focus on covfefe instead of other controversies such as the Russia investigation, resignation of White House communications director Michael Dubke, or U.S.-Germany relations. Trump's tweets have been legally significant in the past. White House Press Secretary Sean Spicer stated that Trump's tweets are "considered official statements by the President of the United States." Trump's Twitter posts have contradicted his agenda by undercutting or contradicting public official statements, and the arguments of U.S. Department of Justice attorneys seeking to defend Trump's decisions in court. In 2017, a federal appellate court cited one of Trump's tweets in upholding a lower court's order blocking Trump's Executive Order 13780 from going into effect. Courts have been clear that Twitter statements can be used as evidence of intent. Trump has blocked a number of users from his "@realDonaldTrump" Twitter account, prompting First Amendment complaints. In a June 2017 letter to Trump, the Knight First Amendment Institute (affiliated with the John S. and James L. Knight Foundation) stated that the Twitter account was a "designated public forum" akin to a public meeting, and the blocking of users violated their constitutional right to freedom of speech. The Institute warned that it could seek legal action on the issue. Legal scholars are split on whether such a challenge would be successful. ^ a b c COVFEFE Act would preserve Trump's tweets as official statements, Reuters (June 13, 2017). ^ a b c Hamza Shaban, The COVFEFE Act would preserve Trump’s tweets as presidential records, Washington Post (June 12, 2017). ^ Andrews, Travis M. (May 31, 2017). "Trump targets 'negative press covfefe' in garbled midnight tweet that becomes worldwide joke". The Washington Post. Archived from the original on May 31, 2017. Retrieved May 31, 2017. ^ Nelson, Louis (May 31, 2017). "Trump jokes on Twitter: Who can figure out 'covfefe'?". Politico. Retrieved May 31, 2017. ^ Berlinger, Joshua (May 31, 2017). "Covfefe: When a typo goes viral". CNN. Archived from the original on May 31, 2017. Retrieved May 31, 2017. ^ "Sean Spicer addresses 'covfefe' kerfuffle: Trump 'and a small group of people know exactly what he meant'". Business Insider. May 31, 2017. Retrieved May 31, 2017. ^ "Is 'covfefe' just another distraction?". The Washington Post. May 31, 2017. Retrieved June 1, 2017. ^ Elizabeth Landers, White House: Trump's tweets are 'official statements', CNN (June 6, 2017). ^ Amber Phillips, Anything Trump tweets can be (and just was) used against him in a court of law, Washington Post (June 12, 2017). ^ Issie Lapowsky, Trump's Twitter Blocking May Violate First Amendment, Wired (June 6, 2017). Laurel Wamsley, "The Covfefe Act Has A Silly Name — But It Addresses A Real Quandary," NPR (June 12, 2017). This page was last edited on 5 April 2019, at 07:46 (UTC).